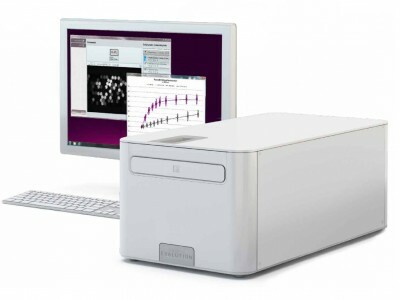 The Critical Diagnostics Presage® ST2 Assay kit is an in vitro diagnostic assay that quantitatively measures ST2 in serum or plasma by enzyme-linked immunosorbant assay (ELISA) in a microtiter plate format. The Presage® ST2 Assay is indicated to be used in conjunction with clinical evaluation as an aid in assessing the prognosis of patients diagnosed with heart failure. Cardiac biomarkers are substances that are released into the bloodstream when the heart is damaged or stressed. In patients with heart failure, measurement of these biomarkers is used to help risk stratify, to assess treatment options, monitor progress, and guide in-hospital and post-discharge care. ST2 is one such biomarker. ST2 is a soluble protein expressed by the heart in response to disease or injury. 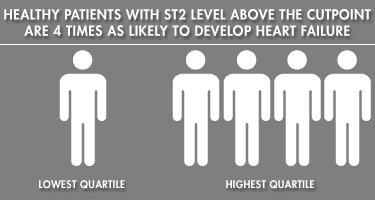 Unlike many other cardiac biomarkers, ST2 levels change quickly in response to changes in the patient’s condition—thus helping physicians make informed decisions on an appropriate course of action to take and, if needed, to quickly adjust treatment. Numerous published studies have demonstrated that the level of ST2 in blood can best predict patient outcomes. Measuring ST2 via a simple, non-invasive blood test allows for the early identification of high-risk heart failure patients for re-hospitalization and mortality versus those at lower risk. For instance, chronic heart failure patients with ST2 levels above the standard cutpoint5 have a THREE times greater risk of 30-day rehospitalization or mortality. As reported in the Merlin study,6 patients who experienced a myocardial infarction and exhibit elevated ST2 levels were FOUR times more likely to develop heart failure within 30 days and at THREE times greater risk of death. By utilizing Critical Diagnostic’s Presage® ST2 Assay as part of a patient management program, clinicians can be more precise in caring for people with chronic heart failure. This may lead to halting or slowing down the progression of the disease. Moreover, ST2 levels are not adversely affected by such confounding factors as age, gender, body mass index, atrial fibrillation, history of heart failure, anemia and impaired renal failure. And unlike natriuretic peptide markers and Galectin-3, ST2 has a single cutpoint, removing any guesswork, making treatment decisions easier. The Presage ST2 Assay from Critical Diagnostics allows accurate prognosis and risk stratification of these chronic heart failure patients, which, in turn, provides an essential element to disease management programs, enabling physicians to select those patients who are identified as requiring focused care. 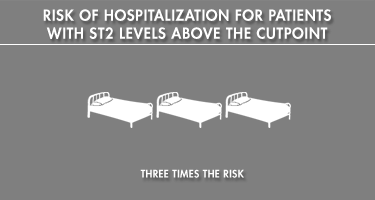 By way of example, published studies have shown that acute heart failure patients with ST2 levels above the standard cutpoint are an alarming 17 times more likely to be rehospitalized and have a three times greater risk of death. Measuring ST2 levels in these patients provides clinically useful information with which to evaluate treatment options. Based on recent studies, ST2 was able to predict the development of heart failure and other adverse outcomes in the general population. The Framingham Heart Study Cohort evaluated over 3,400 “healthy” individuals to determine the prognostic utility of ST2. Study participants were followed for approximately 11 years. ST2 was the most predictive of all biomarkers studied for heart failure or death studied. In a similar study12 of over 1,800 healthy patients followed for approximately a decade, demonstrated those patients with ST2 levels in the highest quartile, had the highest risk for incident HF and mortality—even after rigorous multivariate adjustment for confounders and other biomarkers. According to the Study group on Heart failure Awareness & Perception in Europe (SHAPE). National Academy of National Biochemistry Laboratory Medical Practices Guidelines. Source Socrates, T., et al., Interleukin Family Member ST2 and Mortality in Acute Dyspnea. Framingham Heart Study. 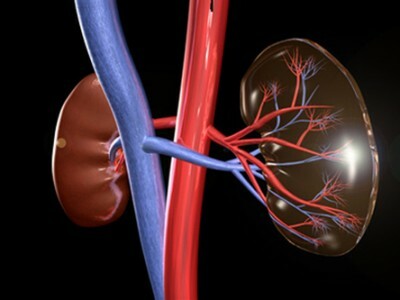 Moreover, when galectin-3 values were adjusted for kidney function, the association with incident heart failure was not statistically relevant. Soluable ST2, as measured by the Presage ST2 Assay. Olmstead Study of Olmsted County, MN residents aged ≥ 45 years and free from clinical HF. A: Of the over one million Europeans that end up in hospital for heart failure each year, an alarming one in four will be re-admitted within 30 days of discharge. 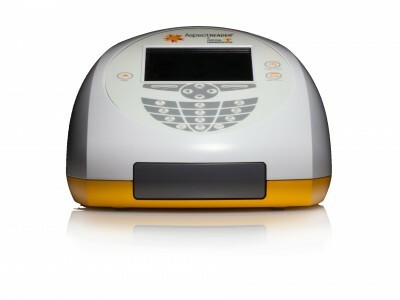 The Presage ST2 Assay from Critical Diagnostics, allows accurate prognosis and risk stratification of these patients, which, in turn, provides an essential element to disease management programs that provides physicians with a means of selecting those who are identified as requiring focused care. 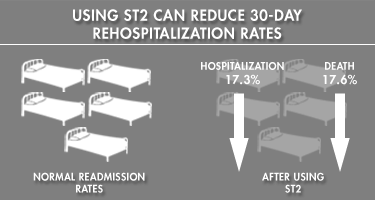 Using ST2 as part of a patient management program can reduce 30-day rehospitalization rates by 17.3% and also reduce 30-day mortality rates by 17.6%. If you’d like a copy of a white paper report on reducing hospital readmissions, go to our website (www.criticaldiagnostics.com). Q: I understand that recent studies show that ST2 was able to predict the development of heart failure and other adverse outcomes in the general population. A. That’s right. The Framingham Heart Study Cohort evaluated over 3,400 “healthy” individuals to determine the prognostic utility of ST2. Study participants were followed for approximately 11 years. ST2 was the most predictive of all markers for heart failure or death studied. In a similar study of over 1,800 healthy patients in Olmstead, MN, followed for approximately a decade, those with ST2 levels in the highest quartile, had the highest risk for incident HF and mortality—even after rigorous multivariate adjustment for confounders and biomarkers. Heart Failure TODAY is a publication of Critical Diagnostics. This magazine aims to inform you about heart failure and is not intended as medical advice or a substitute for consulting a physician.